“In a lecture on the theory of three primary colors, given at the Royal Institution of Great Britain on May 17, 1861, Maxwell presented the first demonstration of a photograph in color. According to the records of that meeting (Maxwell, 1890c, p. 449), Maxwell first discussed Young’s theory of vision (Young, 1845, pp. 344-345; Helmholtz, 1924, pp. 142-146) and the principles involved in making color mixtures. 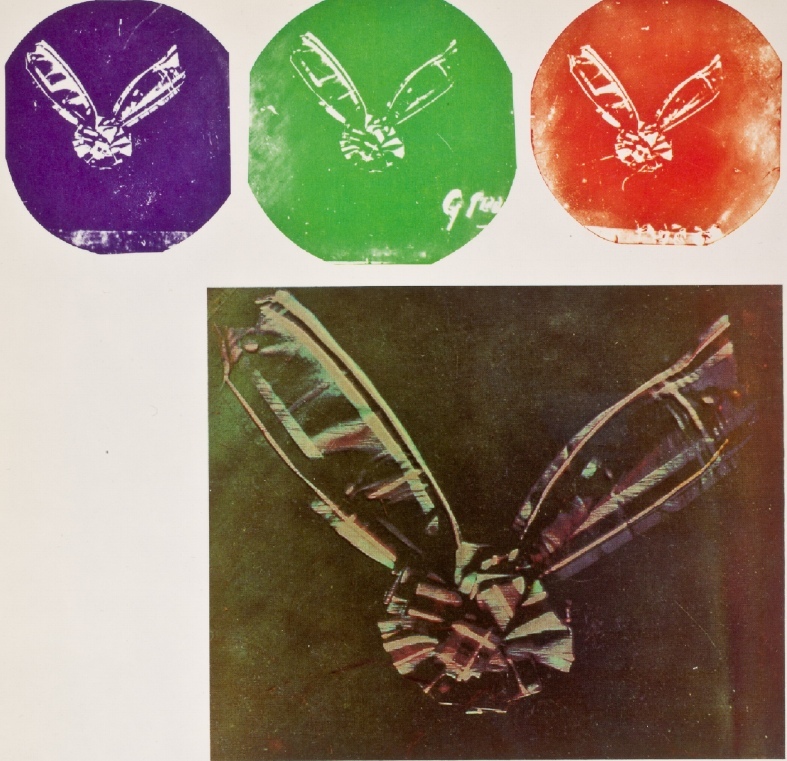 He then illustrated these methods by placing three positive photographic transparencies in different projectors with red, green, and blue filters in their respective light paths, and registering the projected images on a screen. As a photograph, the result was not particularly good, but the principle involved was essentially sound. These same principles actually had been enunciated by Maxwell as early as 1855 (Maxwell, 1890b, pp. 136-137). The photograph demonstrated by Maxwell was prepared by Thomas Sutton, a well-known photographer of that time. Sutton’s description of his work (Sutton, 1861) conflicts in some details with other reports of the Maxwell demonstration. He stated that four photographic transparencies were made and projected, a yellow filter being used in addition to the red, green, and blue ones. The two versions of what took place cannot be reconciled, but it is certain that Maxwell clearly understood that analysis and synthesis by three, and only three, basic colors were required. Sutton found it difficult to obtain a photographic result with the red and yellow filters and, to an even greater extent, the green filter. The filter solutions finally used were so dilute and the exposure times so long that it is quite likely that only radiations from the ultraviolet and blue regions of the spectrum were effective in each case. The lack of sensitivity in the green and red spectral regions was characteristic of all the photographic materials available at that time and, for the major part at least, accounts for the poor quality of Maxwell’s results. It is possible that much of the color seen was of the subjective type due to adaptations similar to those which make two-color photography appear more satisfactory than colorimetric theory would suggest (see Evans, 1943). Clerk Maxwell, James (1861): British Journal Photography, 1861, 8, 272. “This theory of colour may be illustrated by a supposed case taken from the art of photography. Let it be required to ascertain the colours of a landscape, by means of impressions taken on a preparation equally sensitive to rays of every colour. Let a plate of red glass be placed before the camera, and an impression taken. The positive of this will be transparent wherever the red light has been abundant in the landscape, and opaque where it has been wanting. Let it now be put in a magic lantern, along with the red glass, and a red picture will be thrown on the screen. Let this operation be repeated with a green and a violet glass, and, by means of three magic lanterns, let the three images be superimposed on the screen. The colour of any point on the screen will then depend on that of the corresponding point of the landscape; and, by properly adjusting the intensities of the lights, &c., a complete copy of the landscape, as far as visible colour is concerned, will be thrown on the screen. The only apparent difference will be, that the copy will be more subdued, or less pure in tint, than the original. Here, however, we have the process performed twice – first on the screen, and then on the retina. “IV. On the Theory of Compound Colours, and the Relations of the Colours of the Spectrum. By J. CLERK MAXWELL, M.A., Professor of Natural Philosophy in Marischal College and University of Aberdeen. Communicated by Professor STOKES, Sec. R.S. Received January 5, – Read March 22, 1860. According to NEWTON’s analysis of light1, every colour in nature is produced by the mixture, in various proportions, of the different kinds of light into which white light is divided by refraction. By means of a prism we may analyse any coloured light, and determine the proportions in which the different homogeneous rays enter into it; and by means of a lens, we may recombine these rays, and reproduce the original coloured light. NEWTON has also shown2 how to combine the different rays of the spectrum so as to form a single beam of light, and how to alter the proportions of the different colours so as to exhibit the result of combining them in any arbitrary manner. The number of different kinds of homogeneous light being infinite, and the proportion in which each may be combined being also variable indefinitely, the results of such combinations could not be appreciated by the eye, unless the chromatic effect of every mixture, however complicated, could be expressed in some simpler form. Colours, as seen by the human eye of the normal type, can all be reduced to a few classes, and expressed by a few well-known names; and even those colours which have different names have obvious relations among themselves. Every colour, except purple, is similar to some colour of the spectrum3, although less intense; and all purples may be compounded of blue and red, and diluted with white to any required tint. Brown colours, which at first sight seem different, are merely red, orange or yellow of feeble intensity, more or less diluted with white. It appears therefore that the result of any mixture of colours, however complicated, may be defined by its relation to a certain small number of well-known colours. Having selected our standard colours, and determined the relations of a given colour to these, we have defined that colour completely as to its appearance. Any colour which has the same relation to the standard colours, will be identical in appearance, though its optical constitution, as revealed by the prism, may be very different. We may express this by saying that two compound colours may be chromatically identical, but optically different. The optical properties of light are those which have reference to its origin and propagation through media, till it falls on the sensitive organ of vision; the chromatical properties of light are those which have reference to its power of exciting certain sensations of colour, perceived through the organ of vision. The investigation of the chromatic relations of the rays of the spectrum must therefore be founded upon observations of the apparent identity of compound colours, as seen by an eye either of the normal or of some abnormal type; and the results to which the investigation leads must be regarded as partaking of a physiological, as well as of a physical character, and as indicating certain laws of sensation, depending on the constitution of the organ of vision, which may be different in different individuals. We have to determine the laws of the composition of colours in general, to reduce the number of standard colours to the smallest possible, to discover, if we can, what they are, and to ascertain the relation which the homogeneous light of different parts of the spectrum bears to the standard colours. § II. History of the Theory of Compound Colours. The foundation of the theory of the composition of colours was laid by NEWTON4. He first shows that, by the mixture of homogeneal light, colours may be produced which are “like to the colours of homogeneal light as to the appearance of colour, but not as to the immutability of colour and constitution of light.” Red and yellow give an orange colour, which is chromatically similar to the orange of the spectrum, but optically different, because it is resolved into its component colours by a prism, while the orange of the spectrum remains unchanged. When the colours to be mixed lie at a distance from one another in the spectrum, the resultant appears paler than that intermediate colour of the spectrum which it most resembles; and when several are mixed, the resultant may appear white. NEWTON5 is always careful, however, not to call any mixture white, unless it agrees with common white light in its optical as well as its chromatical properties, and is a mixture of all the homogeneal colours. The theory of compound colours is first presented in a mathematical form in prop. 6, “In a mixture of primary colours, the quantity and quality of each being given, to know the colour of the compound.” He divides the circumference of a circle into seven parts, proportional to the seven musical intervals, in accordance with his opinion about the proportions of the colours in the spectrum. At the centre of gravity of each of these arcs he places a little circle, whose area is proportional to the number of rays of the corresponding colour which enter into the given mixture. The position of the centre of gravity of all these circles indicates the nature of the resultant colour. A radius drawn through it points out that colour of the spectrum which it most resembles, and the distance from the centre determines the fulness of its colour. With respect to this construction, NEWTON says, “This rule I conceive accurate says enough for practice, though not mathematically accurate.” He gives no reasons for the different parts of his rule, but we shall find that his method of finding the centre of gravity of the component colours is completely confirmed by my observations, and that it involves mathematically the theory of three elements of colour; but that the disposition of the colours on the circumference of a circle was only a provisional arrangement, and that the true relations of the colours of the spectrum can only be determined by direct observation. YOUNG6 appears to have originated the theory, that the three elements of colour are determined as much by the constitution of the sense of sight as by anything external to us. He conceives that three different sensations may be excited by light, but that the proportion in which each of the three is excited depends on the nature of the light. He conjectures that these primary sensations correspond to red, green, and violet. A blue ray, for example, though homogeneous in itself, he conceives capable of exciting both the green and the violet sensation, and therefore he would call blue a compound colour, though the colour of a simple kind of light. The quality of any colour depends, according to this theory, on the ratios of the intensities of the three sensations which it excites, and its brightness depends on the sum of these three intensities. Sir DAVID BREWSTER, in his paper entitled “On a New Analysis of Solar Light, indicating three Primary Colours, forming Coincident Spectra of equal length,”7 regards the actual colours of the spectrum as arising from the intermixture, in various proportions, of three primary kinds of light, red, yellow, and blue, each of which is variable in intensity, but uniform in colour, from one end of the spectrum to the other; so that every colour in the spectrum is really compound, and might be shown to be so if we had the means of separating its elements. Sir DAVID BREWSTER, in his researches, employed coloured media, which, according to him, absorb the three elements of a single prismatic colour in different degrees, and change their proportions, so as to alter the colour of the light, without altering its refrangibility. In this paper I shall not enter into the very important questions affecting the physical theory of light, which can only be settled by a careful inquiry into the phenomena of absorption. The physiological facts, that we have a threefold sensation of colour, and that the three elements of this sensation are affected in different proportions by light of different refrangibilities, are equally true, whether we adopt the physical theory that there are three kinds of light corresponding to these three colour-sensations, or whether we regard light of definite refrangibility as an undulation of known length, and therefore variable only in intensity, but capable of producing different chemical actions on different substances, of being absorbed in different degrees by different media, and of exciting in different degrees the three different colour-sensations of the human eye. 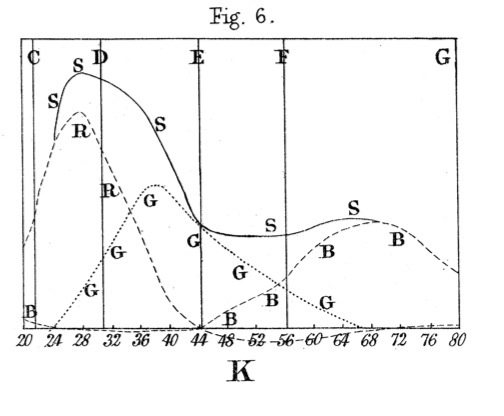 Sir DAVID BREWSTER has given a diagram of three curves, in which the base-line represents the length of the spectrum, and the ordinates of the curves represent, by estimation, the intensities of the three kinds of light at each point of the spectrum. I have employed a diagram of the same kind to express the results arrived at in this paper, the ordinates being made to represent the intensities of each of the three elements of colour, as calculated from the experiments. The most complete series of experiments on the mixture of the colours of the spectrum, is that of Professor HELMHOLTZ8 of Königsberg. By using two slits at right angles to one another, he formed two pure spectra, the fixed lines of which were seen crossing one another when viewed in the ordinary way by means of a telescope. The colours of these spectra were thus combined in every possible way, and the effect of the combination of any two could be seen separately by drawing the eye back from the eyepiece of the telescope, when the components was altered by turning the combined slits round in their own plane. One result of these experiments was, that a colour, chromatically identical with white, could be formed by combining yellow with indigo. M. HELMHOLTZ was not then able to produce white with any other pair of simple colours, and considered that three simple colours were required in general to produce white, one from each of the three portions into which the spectrum is divided by the yellow and indigo. Professor GRASSMANN9 showed that NEWTON’s theory of compound colours implies that there are an infinite number of pairs of complementary colours in the spectrum, and pointed out the means of finding them. He also showed how colours may be represented by lines, and combined by the method of the parallelogram. In a second memoir10, M. HELMHOLTZ describes his method of ascertaining these pairs of complementary colours. He formed a pure spectrum by means of a slit, a prism, and a lens; and in this spectrum he placed an apparatus having two parallel slits which were capable of adjustment both in position and breadth, so as to let through any two portions of the spectrum, in any proportions. Behind this slit, these rays were united in an image of the prism, which was received on paper. By arranging the slits, the colour of this image may be reduced to white, and made identical with that of paper illuminated with white light. The wave-lengths of the component colours were then measured by observing the angle of diffraction through a grating. It was found that the colours from red to green-yellow (λ=2082) were complementary to colours ranging from green-blue (λ =1818) to violet, and that the colours between green-yellow and green-blue have no homogeneous complementaries, but must be neutralized by mixtures of red and violet. 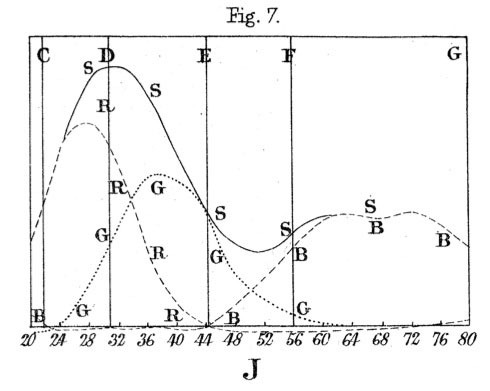 M. HELMHOLTZ also gives a provisional diagram of the curve formed by the spectrum on NEWTON’s diagram, for which his experiments did not furnish him with the complete data. Accounts of experiments by myself on the mixture of artificial colours by rapid rotation, may be found in the Transactions of the Royal Society of Edinburgh, vol. xxi. pt. 2 (1855); in an appendix to Professor GEORGE WILSON’s work on Colour-Blindness; in the Report of the British Association for 1856, p. 12; and in the Philosophical Magazine, July 1857, p. 40. These experiments show that, for the normal eye, there are three, and only three, elements of colour, and that in the colour-blind one of these is absent. They also prove that chromatic observations may be made, both by normal and abnormal eyes, with such accuracy, as to warrant the employment of the results in the calculation of colour-equations, and in laying down colour-diagrams by NEWTON’s rule. The first instrument which I made (in 1852) to examine the mixtures of the colours of the spectrum was similar to that which I now use, but smaller, and it had no constant light for a term of comparison. The second was 6½ feet long, made in 1855, and showed two combinations of colour side by side. I have now succeeded in making the mixture much more perfect, and the comparisons more exact, by using white reflected light, instead of the second compound colour. 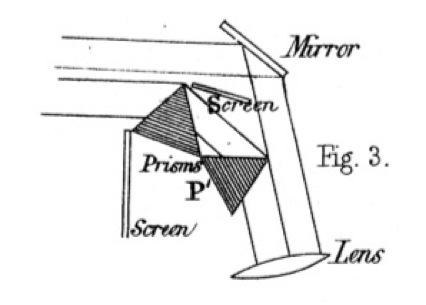 An apparatus in which the light passes through the prisms, and is reflected back again in nearly the same path by a concave mirror, was shown by me to the British Association in 1856. It has the advantage of being portable, and need not be more than half the length of the other, in order to produce a spectrum of equal length. I am so well satisfied with the working of this form of the instrument, that I intend to make use of it in obtaining equations from a greater variety of observers than I could meet with when I was obliged to use the more bulky instrument. It is difficult at first to get the observer to believe that the compound light can ever be so adjusted as to appear to his eyes identical with the white light in contact with it. He has to learn what adjustments are necessary to produce the requisite alteration under all circumstances, and he must never be satisfied till the two parts of the field are identical in colour and illumination. To do this thoroughly, implies not merely good eyes, but a power of judging as to the exact nature of the difference between two very pale and nearly identical tints, whether they differ in the amount of red, green, or blue, or in brightness of illumination. In the following paper I shall first lay down the mathematical theory of NEWTON’s diagram, with its relation to YOUNG’s theory of the colour-sensation. I shall then describe the experimental method of mixing the colours of the spectrum, and determining the wave-lengths of the colours mixed. 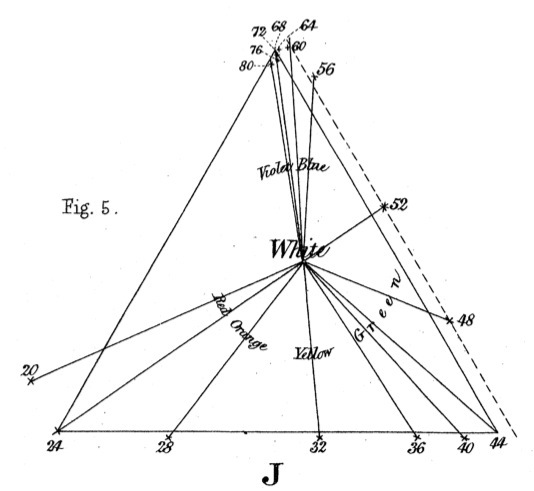 The results of my experiments will then be given, and the chromatic relations of the spectrum exhibited in a system of colour-equations, in NEWTON’s diagram, and in three curves of intensity, as in BREWSTER’s diagram. The differences between the results of two observers will then be discussed, showing on what they depend, and in what way such differences may affect the vision of persons otherwise free from defects of sight. § III. Mathematical Theory of NEWTON’s Diagram of Colours. 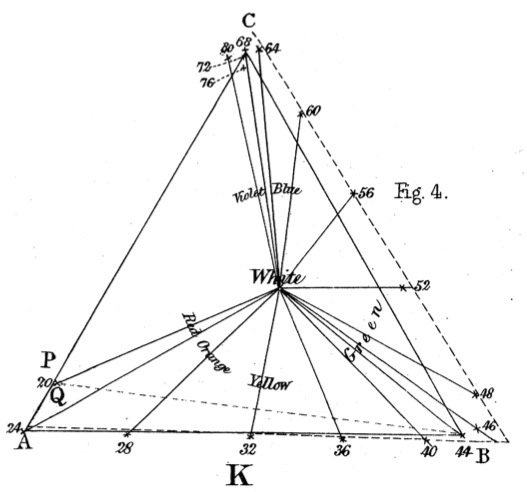 NEWTON’s diagram is a plane figure, designed to exhibit the relations of colours to each other. Every point in the diagram represents a colour, simple or compound, and we may conceive the diagram itself so painted, that every colour is found at its corresponding point. Any colour, differing only in quantity of illumination from one of the colours of the diagram, is referred to it as a unit, and is measured by the ratio of the illumination of the given colour to that of the corresponding colour in the diagram. In this way the quantity of a colour is estimated. The resultant of mixing any two colours of the diagram is found by dividing the line joining them inversely as the quantity of each; then, if the sum of these quantities is unity, the resultant will have the illumination as well as the colour of the point so found; but if the sum of the components is different from unity, the quantity of the resultant will be measured by the sum of the components. This method of determining the position of the resultant colour is mathematically identical with that of finding the centre of gravity of two weights, and placing a weight equal to their sum at the point so found. We shall therefore speak of the resultant tint as the sum of its components placed at their centre of gravity. By compounding this resultant tint with some other colour, we may find the position of a mixture of three colours, at the centre of gravity of its components; and by taking these components in different proportions, we may obtain colours corresponding to every part of the triangle of which they are the angular points. In this way, by taking any three colours we should be able to construct a triangular portion of NEWTON’s diagram by painting it with mixtures of the three colours. Of course these mixtures must be made to correspond with optical mixtures of light, not with mechanical mixtures of pigments. Let us now take any colour belonging to a point of the diagram outside this triangle. To make the centre of gravity of the three weights coincide with this point, one or more of the weights must be made negative. This, though following from mathematical principles, is not capable of direct physical interpretation, as we cannot exhibit a negative colour. u+z=x+y (3. ),which may be interpreted to mean, that the resultant tint, u+z, is identical with the resultant, x+y. We thus find a mixture of the new colour with one of the selected colours, which is chromatically equivalent to a mixture of the other two selected colours. u+y+z=x (5. ),which means that a mixture of certain proportions of the new colour and two of the three selected, is chromatically equivalent to the third. We may thus in all cases find the relation between any three colours and a fourth, and exhibit this relation in a form capable of experimental verification; and by proceeding in this way we may map out the positions of all colours upon NEWTON’s diagram. Every colour in nature will then be defined by the position of the corresponding colour in the diagram, and by the ratio of its illumination to that of the colour in the diagram. § IV. Method of representing Colours by Straight Lines drawn from a Point. To extend our ideas of the relations of colours, let us form a new geometrical conception by the aid of solid geometry. Let us take as origin any point not in the plane of the diagram, and let us draw lines through this point to the different points of the diagram; then the direction of any of these lines will depend upon the position of the point of the diagram through which it passes, so that we may take this line as the representative of the corresponding colour on the diagram. In order to indicate the quantity of this colour, let it be produced beyond the plane of the diagram in the same ratio as the given colour exceeds in illumination the colour on the diagram. In this way every colour in nature will be represented by a line drawn through the origin, whose direction indicates the quality of the colour, while its length indicates its quantity. Let us find the resultant of two colours by this method. Let O be the origin and AB be a section of the plane of the diagram by that of the paper. Let OP, OQ be lines representing colours, A, B the corresponding points in the diagram; then the quantity of P will be OP/OA=p and that of Q will be OQ/OB=q. The resultant of these will be represented in the diagram by the point C, where AC : CB :: q : p, and the quantity of the resultant will be p+q, so that if we produce OC to R, so that OR=(p+q)OC, the line OR will represent the resultant of OP and OQ in direction and magnitude. It is easy to prove, from this construction, that OR is the diagonal of the parallelogram of which OP and OQ are two sides. It appears therefore that if colours are represented in quantity and quality by the magnitude and direction of straight lines, the rule for the composition of colours is identical with that for the composition of forces in mechanics. This analogy has been well brought out by Professor GRASSMANN in POGGENDORFF’s ‘Annalen,’ Bd. lxxxix. We may conceive an arrangement of actual colours in space founded upon this construction. Suppose each of these radiating lines representing a given colour to be itself illuminated with that colour, the brightness increasing from zero at the origin to unity, where it cuts the plane of the diagram, and becoming continually more intense in proportion to the distance from the origin. In this way every colour in nature may be matched, both in quality and quantity, by some point in this coloured space. If we take any three lines through the origin as axes, we may, by coordinates parallel to these lines, express the position of any point in space. That point will correspond to a colour which is the resultant of the three colours represented by the three coordinates. This system of coordinates is an illustration of the resolution of a colour into three components. According to the theory of YOUNG, the human eye is capable of three distinct primitive sensations of colour, which, by their composition in various proportions, produce the sensations of actual colour in all their varieties. Whether any kinds of light have the power of exciting these primitive sensations separately, has not yet been determined. If colours corresponding to the three primitive sensations can be exhibited, then all colours, whether produced by light, disease, or imagination, are compounded of these, and have their places within the triangle formed by joining the three primaries. If the colours of the pure spectrum, as laid down on the diagram, form a triangle, the colours at the angles may correspond to the primitive sensations. If the curve of the spectrum does not reach the angles of the circumscribing triangle, then no colour in the spectrum, and therefore no colour in nature, corresponds to any of the three primary sensations. The only data at present existing for determining the primary colours, are derived from the comparison of observations of colour-equations by colour-blind, and by normal eyes. The colour-blind equations differ from the others by the non-existence of one of the elements of colour, the relation of which to known colours can be ascertained. It appears, from observations made for me by two colour-blind persons11, that the elementary sensation which they do not possess is a red approaching to crimson, lying beyond both vermilion and carmine. These observations are confirmed by those of Mr. POLE, and by others which I have obtained since. I have hopes of being able to procure a set of colour-blind equations between the colours of the spectrum, which will indicate the missing primary in a more exact manner. The experiments which I am going to describe have for their object the determination of the position of the colours of the spectrum upon NEWTON’s diagram, from actual observations of the mixtures of those colours. They were conducted in such a way, that in every observation the judgment of the observer was exercised upon two parts of an illuminated field, one of which was so adjusted as to be chromatically identical with the other, which, during the whole series of observations, remained of one constant intensity of white. In this way the effects of subjective colours were entirely got rid of, and all the observations were of the same kind, and therefore may claim to be equally accurate; which is not the case when comparisons are made between bright colours of different kinds. The chart of the spectrum, deduced from these observations, exhibits the colours arranged very exactly along two sides of a triangle, the extreme red and violet forming doubtful portions of the third side. This result greatly simplifies the theory of colour, if it does not actually point out the three primary colours themselves. § V. Description of an Instrument for making definite Mixtures of the Colours of the Spectrum. The experimental method which I have used consists in forming a combination of three colours belonging to different portions of the spectrum, the quantity of each being so adjusted that the mixture shall be white, and equal in intensity to a given white. Fig. 1 represents the instrument for making the observations. It consists of two tubes, or long boxes, of deal, of rectangular section, joined together at an angle of about 100°. The part AK is about 5 feet long, 7 inches broad, and 4 deep; KN is about 2 feet long, 5 inches broad, and 4 deep; BD is a partition parallel to the side of the long box. The whole of the inside of the instrument is painted black, and the only openings are at the end AC, and at E. At the angle there is a lid, which is opened when the optical parts have to be adjusted or cleaned. At E is a fine vertical slit; L is a lens; at P there are two equilateral prisms. The slit E, the lens L, and the prisms P are so adjusted, that when light is admitted at E a pure spectrum is formed at AB, the extremity of the long box. A mirror at M is also adjusted so as to reflect the light from E along the narrow compartment of the long box to BC. See fig. 3. At AB is placed the contrivance shown in fig. 2. A’B’ is a rectangular frame of brass, having a rectangular aperture of 6×1 inches. On this frame are placed six brass sliders, XYZ. Each of these carries a knife-edge of brass in the plane of the surface of the frame. These six moveable knife-edges form three slits, XYZ, which may be so adjusted as to coincide with any three portions of the pure spectrum formed by light from E. The intervals behind the sliders are closed by hinged shutters, which allow the sliders to move without letting light pass between them. The inner edge of the brass frame is graduated to twentieths of an inch, so that the position of any slit can be read off. The breadth of the slit is ascertained by means of a wedge-shaped piece of metal, 6 inches long, and tapering to a point from a breadth of half an inch. This is gently inserted into each slit, and the breadth is determined by the distance to which it enters, the divisions on the wedge corresponding to the 200th of an inch difference in breadth, so that the unit of breadth this ·005 inch. Now suppose light to enter at E, to pass through the lens, and to be refracted by the two prisms at P; a pure spectrum, showing FRAUNHOFER’s lines, is formed at AB but only that part is allowed to pass which falls on the three slits XYZ. The rest is stopped by the shutters. Suppose that the portion falling on X belongs to the red part of the spectrum; then, of the white light entering at E, only the red will come through the slit X. If we were to admit red light at X it would be refracted to E, by the principle in Optics, that the course of any ray may be reversed. If, instead of red light, we were to admit white light at X, still only red light would come to E; for all other light would be either more or less refracted, and would not reach the slit at E. Applying the eye at the slit E, we should see the prism P uniformly illuminated with red light, of the kind corresponding to the part of the spectrum which falls on the slit X when white light is admitted at E.
Let the slit Y correspond to another portion of the spectrum, say the green; then, if white light is admitted at Y, the prism, as seen by an eye at E, will be uniformly illuminated with green light; and if white light be admitted at X and Y simultaneously, the colour seen at E will be a compound of red and green, the proportions depending on the breadth of the slits and the intensity of the light which enters them. The third slit, Z, enables us to combine any three kinds of light in any given proportions, so that an eye at E shall see the face of the prism at P uniformly illuminated with the colour resulting from the combination of the three. The position of these three rays in the spectrum is found by admitting the light at E, and comparing the position of the slits with the position of the principal fixed lines; and the breadth of the slits is determined by means of the wedge. At the same time white light is admitted through BC to the mirror of black glass at M, whence it is reflected to E, past the edge of the prism at P, so that the eye at E sees through the lens a field consisting of two portions, separated by the edge of the prism; that on the left hand being compounded of three colours of the spectrum refracted by the prism, while that on the right hand is white light reflected from the mirror. By adjusting the slits properly, these two portions of the field may be made equal, both in colour and brightness, so that the edge of the prism becomes almost invisible. In making experiments, the instrument was placed on a table in a room moderately lighted, with the end AB turned towards a large board covered with white paper, and placed in the open air, so as to be uniformly illuminated by the sun. In this way the three slits and the mirror M were all illuminated with white light of the same intensity, and all were affected in the same ratio by any change of illumination; so that if the two halves of the field were rendered equal when the sun was under a cloud, they were found nearly correct when the sun again appeared. No experiments, however, were considered good unless the sun remained uniformly bright during the whole series of experiments. After each set of experiments light was admitted at E, and the position of the fixed lines D and F of the spectrum was read off on the scale at AB. It was found that after the instrument had been some time in use these positions were invariable, showing that the eye-hole, the prisms, and the scale might be considered as rigidly connected. § VI. Method of determining the Wave-length corresponding to any point of the Spectrum on the Scale AB. Two plane surfaces of glass were kept apart by two parallel strips of goldbeaters’ leaf, so as to enclose a stratum of air of nearly uniform thickness. Light reflected from this stratum of air was admitted at E, and the spectrum formed by it was examined at AB by means of a lens. This spectrum consists of a large number of bright bands, separated by dark spaces at nearly uniform intervals, these intervals, however, being considerably larger as we approach the violet end of the spectrum. The reason of these alternations of brightness is easily explained. By the theory of NEWTON’s rings, the light reflected from a stratum of air consists of two parts, one of which has traversed a path longer than that of the other, by an interval depending on the thickness of the stratum and the angle of incidence. Whenever the interval of retardation is an exact multiple of a wave-length, these two portions of light destroy each other by interference; and when the interval is an odd number of half wave-lengths, the resultant light is a maximum. In the ordinary case of NEWTON’s rings, these alternations depend upon the varying thickness of the stratum; while in this case a pencil of rays of different wave-lengths, but all experiencing the same retardation, is analysed into a spectrum, in which the rays are arranged in order of their respective wave-lengths. Every ray whose wave-length is an exact submultiple of the retardation will be destroyed by interference, and its place will appear dark in the spectrum; and there will be as many dark bands seen as there are rays whose wave-lengths fulfil this condition. If, then, we observe the positions of the dark bands on the scale AB, the wave-lengths corresponding to these positions will be a series of submultiples of the retardation. There were 22 bands visible, corresponding to 22 different positions on the scale AB, as determined 4th August, 1859. Having thus selected sixteen distinct points of the spectrum on which to operate, and determined their wave-lengths and apparent colours, I proceeded to ascertain the mathematical relations between these colours in order to lay them down on NEWTON’s diagram. For this purpose I selected three of these as points of reference, namely, those at 24, 44, and 68 of the scale. I chose these points because they are well separated from each other on the scale, and because the colour of the spectrum at these points does not appear to the eye to vary very rapidly, either in hue or brightness, in passing from one point to another. Hence a small error of position will not make so serious an alteration of colour at these points, as if we had taken them at places of rapid variation; and we may regard the amount of the illumination produced by the light entering through the slits in these positions as sensibly proportional to the breadth of the slits. (24) corresponds to a bright scarlet about one-third of the distance from C to D; (44) is a green very near the line E; and (68) is a blue about one-third of the distance from F to G.
§ VII. Method of Observation. 18·5(24)+27(44)+37(68)= W* (13. ).This equation means that on the 18th of October the observer J. (myself) made an observation in which the breadth of the slit X was 18·5, as measured by the wedge, while its centre was at the division (24) of the scale; that the breadths of Y and Z were 27 and 37, and their positions (44) and (68); and that the illumination produced by these slits was exactly equal, in my estimation as an observer, to the constant white W.
16(28)=18·5(24)+6(44) (15. 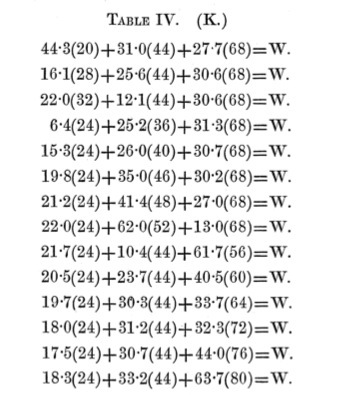 ),showing that (28) can be made up of (24) and (44), in the proportion of 18·5 to 6. In this way, by combining each colour with two standard colours, we may produce a white equal to the constant white. The red and yellow colours from (20) to (32) must be combined with green and blue, the greens from (36) to (52) with red and blue, and the blues from (56) to (80) with red and green. § VIII. Determination of the Average Error in Observations of different kinds. In order to estimate the degree of accuracy of these observations, I have taken the differences between the values of the three standard colours as originally observed, and their means as given by the above Table. The sum of all the errors of the red (24) from the means, was 31·1, and the number of observations was 42, which gives the average error ·74. The sum of errors in green (44) was 48·0, and the number of observations 31, giving a mean error 1·55. 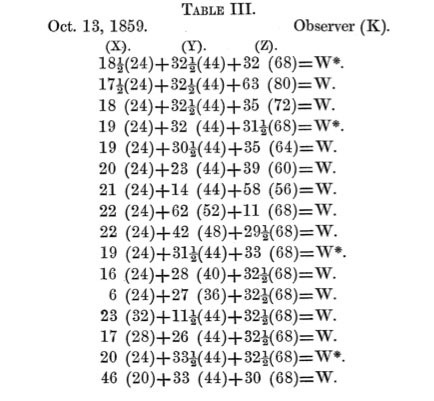 The sum of the errors in blue (68) was 46·9, and the number of observations 35, giving a mean error 1·16. It appears therefore that in the observations generally, the average error does not exceed 1·5; and therefore the results, if confirmed by several observations, may safely be trusted to that degree of accuracy. 18·6(24)+ 31·4(44)+30·5(68)= W* (16. )as the standard equation. We may use the twenty observations of this equation as a means of determining the relations between the errors in the different colours, and thus of estimating the accuracy of the observer in distinguishing colours. It appears from the first column that the red is more accurately observed than the green and blue. § IX. Relative Accuracy in Observations of Colour and of Brightness. If the errors in the different colours occurred perfectly independent of each other, then the probable mean error in the sum or difference of any two colours would be the square root of the sum of their squares, as given in the fourth column. It will be seen, however, that the number in the second column is always less, and that in the third always greater, than that in the fourth; showing that the errors are not independent of each other, but that positive errors in any colour coincide more often with positive than with negative errors in another colour. Now the hue of the resultant depends on the ratios of the components, while its brightness depends on their sum. Since, therefore, the difference of two colours is always more accurately observed than their sum, variations of colour are more easily detected than variations in brightness, and the eye appears to be a more accurate judge of the identity of colour of the two parts of the field than of their equal illumination. The same conclusion may be drawn from the value of the mean error of the sum of the three standards, which is 2·67, while the square root of the sum of the squares of the errors is 1·76. § X. Reduction of the Observations. By eliminating W from the equations of Table IV by means of the standard equation, we obtain equations involving each of the fourteen selected colours of the spectrum, along with the three standard colours; and by transposing the selected colour to one side of the equation, we obtain its value in terms of the three standards. If any of the terms of these equations are negative, the equation has no physical interpretation as it stands, but by transposing the negative term to the other side it becomes positive, and then the equation may be verified. The following Table contains the values of the fourteen selected tints in terms of the standards. To avoid repetition, the symbols of the standard colours are placed at the head of each column. From these equations we may lay down a chart of the spectrum on NEWTON’s diagram by the following method: – Take any three points, A, B, C, and let A represent the standard colour (24), B (44), and C (68). Then, to find the position of any other colour, say (20), divide AC in P so that (18·6)AP = (2·8)PC, and then divide BP in Q so that (18·6+2·8)PQ = (0·4)QB. At the point Q the colour corresponding to (20) must be placed. In this way the diagram of fig. 4 has been constructed from the observations of all the colours. § XI. The Spectrum as laid down on NEWTON’S Diagram. All the other colours of the spectrum may be produced by combinations of these; and since all natural colours are compounded of the colours of the spectrum, they may be compounded of these three primary colours. I have strong reason to believe that these are the three primary colours corresponding to three modes of sensation in the organ of vision, on which the whole system of colour, as seen by the normal eye, depends. § XII. Results found by a second Observer. showing that in this case, also, the power of distinguishing colour is more to be depended on than that of distinguishing degrees of illumination. The average error in the other observations from the means was ·64 red, ·76 for green, and 1·02 for blue. The relations of the colours, as given by these observations, are laid down in fig. 5. It appears from this diagram, that the positions of the colours lie nearly in a straight line from (24) to (44), and from (48) to (60). The colours beyond (60) are crowded together, as in the other diagram, and the observations are not yet sufficiently accurate to distinguish their relative positions accurately. The colour (20) at the red end of the spectrum is further from the line joining (24) and (68) than in the other diagram, but I have not obtained satisfactory observations of these extreme colours. It will be observed that (32), (36), and (40) are placed further to the right in fig. 5 than in fig. 4, showing that the second observer (J.) sees more green in these colours than the first (K.), also that (48), (52), (56), and (60) are much further up in fig. 5, showing that to the second observer they appear more blue and less green. These differences were well seen in making an observation. When the instrument was adjusted to suit the first observer (K.), then, if the selected colour were (32), (36), or (40), the second (J. ), on looking into the instrument, saw it too green; but if (48), (52), (56), or (60) were the selected colour, then, if right to the first observer, it appeared too blue to the second. If the instrument were adjusted to suit the second observer, then, in the first case, the other saw red, and in the second green; showing that there was a real difference in the eyes of these two individuals, producing constant and measurable differences in the apparent colour of objects. § XIV. Comparison by Curves of Intensity of the Primaries. Figs. 6 and 7, are intended to indicate the intensities of the three standard colours at different points of the spectrum. The curve marked (R) indicates the intensity of the red or (24), (G) that of green or (44), and (B) that of blue or (68). The curve marked (S) has its ordinates equal to the sum of the ordinates of the other three curves. The intensities are found by dividing every colour-equation by the coefficient of the colour on the left-hand side. Fig. 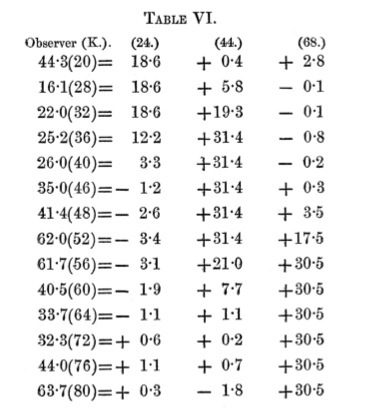 6 represents the results of observations by K, and fig. 7 represents those of J. It will be observed that the ordinates in fig. 7 are smaller between (48) and (56) than in fig. 6. 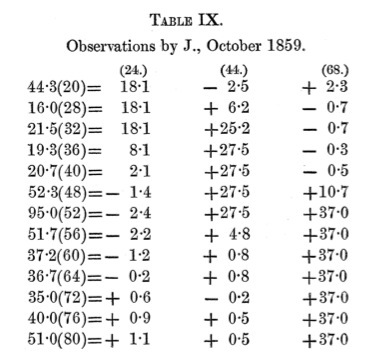 This indicates the feeble intensity of certain kinds of light as seen by the eyes of J, which made it impossible to get observations of the colour (52) at all without making the slit so wide as to include all between (48) and (56). This blindness of my eyes to the parts of the spectrum between the fixed lines E and F appears to be confined to the region surrounding the axis of vision, as the field of view, when adjusted for my eyes looking directly at the colour, is decidedly out of adjustment when I view it by indirect vision, turning the axis of my eye towards some other point. The prism then appears greener and brighter than the mirror, showing that the parts of my eye at a distance from the axis are more sensitive to this blue-green light than the parts close to the axis. It is to be noticed that this insensibility is not to all light of a green or blue colour, but to light of a definite refrangibility. If I had a species of colour-blindness rendering me totally or partially insensible to that element of colour which most nearly corresponds with the light in question, then the light from the mirror, as well as that from the prism, would appear to me deficient in that colour, and I should still consider them chromatically identical; or if there were any difference, it would be the same for all colours nearly the same in appearance, such as those just beyond the line F, which appear to me quite bright. We must also observe that the peculiarity is confined to a certain portion of the retina, which is known to be of a yellow colour, and which is the seat of several ocular phenomena observed PURKINJE and WHEATSTONE, and of the sheaf or brushes seen by HAIDINGER in polarized light; and also that though, of the two observers whose results are given here, one is much more affected with this peculiarity than the other, both are less sensible to the light between E and F than to that on either side; and other observers, whose results are not here given, confirm this. § XV. Explanation of the Differences between the two Observers. I think, therefore, that the yellow spot at the foramen centrale of SOEMMERING will be found to be the cause of this phenomenon, and that it absorbs the rays between E and F, and would, if placed in the path of the incident light, produce a corresponding dark band in the spectrum formed by a prism. The reason why white light does not appear yellow in consequence, is that this absorbing action is constant, and we reckon as white the mean of all the colours we are accustomed to see. This may be proved by wearing spectacles of any strong colour for some time, when we shall find that we judge white objects to be white, in spite of the rays which enter the eye being coloured. Now ordinary white light is a mixture of all kinds of light, including that between E and F, which is partially absorbed. If, therefore, we compound an artificial white containing the absorbed ray as one of its three components, it will be much more altered by the absorption than the ordinary light, which contains many rays of nearly the same colour, which are not absorbed. On the other hand, if the artificial light do not contain the absorbed ray, it will be less altered than the ordinary light which contains it. Hence the greater the absorption the less green will those colours appear which are near the absorbed part, such as (48), (52), (56), and the more green will the colours appear which are not near it, such as (32), (36), (40). And these are the chief differences between fig. 4 and fig. 5. I first observed this peculiarity of my eyes when observing the spectrum formed by a very long vertical slit. I saw an elongated dark spot running up and down in the blue, as if confined in a groove, and following the motion of the eye as it moved up or down the spectrum, but refusing to pass out of the blue into other colours. By increasing the breadth of the spectrum, the dark portion was found to correspond to the foramen centrale, and to be visible only when the eye is turned towards the blue-green between E and F. The spot may be well seen by first looking at a yellow paper, and then at a blue one, when the spot will be distinctly seen for a short time, but it soon disappears when the eye gets accustomed to the blue12. I have been the more careful in stating this peculiarity of my eyes, as I have reason to believe that it affects most persons, especially those who can see HAIDINGER’s brushes easily. Such persons, in comparing their vision with that of others, may be led to think themselves affected with partial colour-blindness, whereas their colour-vision may be of the ordinary kind, but the rays which reach their sense of sight may be more or less altered in their proportions by passing through the media of the eye. The existence of real, though partial colour-blindness will make itself apparent, in a series of observations, by the discrepancy between the observed values and the means being greater in certain colours than in others. Neither of the observers whose results are given here show any indications of colour-blindness, and when the differences arising from the absorption of the rays between E and F are put out of account, they agree in proving that there are three colours in the spectrum, red, green, and blue, by the mixtures of which colours chromatically identical with the other colours of the spectrum may be produced. The exact position of the red and blue is not yet ascertained; that of the green is ¼ from E towards F.
The orange and yellow of the spectrum are chromatically equivalent to mixtures of red and green. They are neither richer nor paler than the corresponding mixtures, and the only difference is that the mixture may be resolved by a prism, where as the colour in the spectrum cannot be so resolved. This result seems to put an end to the pretension of yellow to be considered a primary element of colour. In the same way the colours from the primary green to blue are chromatically identical with mixtures of these; and the extreme ends of the spectrum are probably equivalent to mixtures of red and blue, but they are so feeble in illumination that experiments on the same plan with the rest can give no result, but they must be examined by some special method. 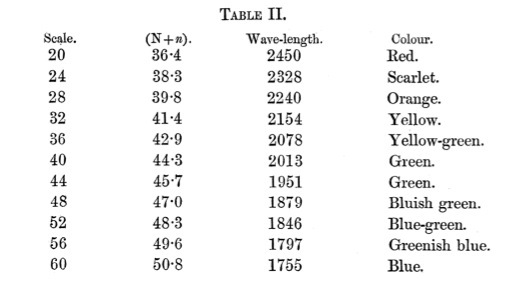 When observations have been obtained from a greater number of individuals, including those whose vision is dichromatic, the chart of the spectrum may be laid down independently of accidental differences, and a more complete discussion of the laws of the sensation of colour attempted. Received May 8, – Read May 24, 1860. 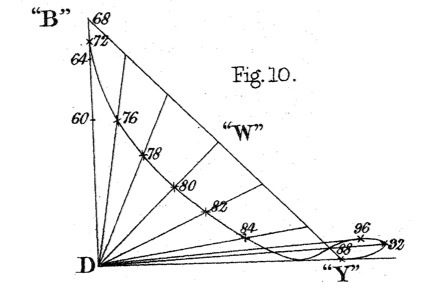 The instrument used in making these observations was similar in principle to that formerly described, except that, in order to render it portable, the rays are reflected back through the prisms, nearly in their original direction; thus rendering one of the limbs of the instrument unnecessary, and allowing the other to be shortened considerably on account of the greater angular dispersion. The principle of reflecting light, so as to pass twice through the same prism, was employed by me in an instrument for combining colours made in 1856, and a reflecting instrument for observing the spectrum has been constructed independently by M. PORRO. Light from a sheet of paper illuminated by sunlight is admitted at the slits X, Y, Z (fig. 8), falls on the prisms P and P’ (angles= 45°), then on a concave silvered glass, S, radius 34 inches. The light, after reflexion, passes again through the prisms P’ and P, and is reflected by a small mirror, e, to the slit E, where the eye is placed to receive the light compounded of the colours corresponding to the positions and breadths of the slits X, Y, and Z. At the same time, another portion of the light from the illuminated paper enters the instrument at BC, is reflected at the mirror M, passes through the lens L, is reflected at the mirror M’, passes close to the edge of the prism P, and is reflected along with the coloured light at e, to the eye-slit at E.
In this way the compound colour is compared with a constant white light in optical juxtaposition with it. The mirror M is made of silvered glass, that at M’ is made of glass roughened and blackened at the back, to reduce the intensity of the constant light to a convenient value for the experiments. This instrument gives a spectrum in which the lines are very distinct, and the length of the spectrum from A to H is 3·6 inches. The outside measure of the box is 3 feet 6 inches, by 11 inches by 4 inches, and it can be carried about, and set up in any position, without readjustment. It was made by Messrs. SMITH and RAMAGE of Aberdeen. In obtaining observations from colour-blind persons, two slits only are required to produce a mixture chromatically equivalent to white; and at one point of the spectrum the colour of the pure rays appears identical with white. This point is near the line F, a little on the less refrangible side. From this point to the more refrangible end of the spectrum appears to them “blue.” The colours on the less refrangible side appear to them all of the same quality, but of different degrees of brightness; and when any of them are made sufficiently bright, they are called “yellow.” It is convenient to use the term “yellow” in speaking of the colours from red to green inclusive, since it will be found that a dichromic person in speaking of red, green, orange, and brown, refers to different degrees of brightness or purity of a single colour, and not to different colours perceived by him. This colour we may agree to call “yellow,” though it is not probable that the sensation of it is like that of yellow as perceived by us. Of the three standard colours which I formerly assumed, the red appears to them “yellow,” but so feeble that there is not enough in the whole red division of the spectrum to form an equivalent to make up the standard white. The green at E appears a good “yellow,” and the blue at ⅔ from F towards G appears a good “blue.” I have therefore taken these as standard colours for reducing dichromic observations. The three standard colours will be referred to as (104), (88), and (68), these being the positions of the red, green, and blue on the scale of the new instrument. Error of (88)=2·5; of (68)=2·3; of (88)+(68)=4·8; of (88)-(68)=1·3.The fact that the mean error of the sum was so much greater than the mean error of the difference, indicates that in this case, as in all others that I have examined, observations of equality of tint can be depended on much more than observations of equality of illumination or brightness. 23(104)-1·7(88)-1·1(68)=D (5. ),in which the defective sensation is much nearer to the red of the spectrum. It is probably a colour to which the extreme red of the spectrum tends, and which differs from the extreme red only in not containing that small proportion of “yellow” light which renders it visible to the colour-blind. A, 116; a, 112; B, 110; C, 106; D, 98·3; E, 88; F, 79; G, 61; H, 44.The values of the standard colours in different parts of the spectrum are given on the right side of the above Table, and are represented by the curves of fig. 9, where the left-hand curve represents the intensity of the “yellow” element, and the right-hand curve that of the “blue” element of colour as it appears to the colour-blind. In fig. 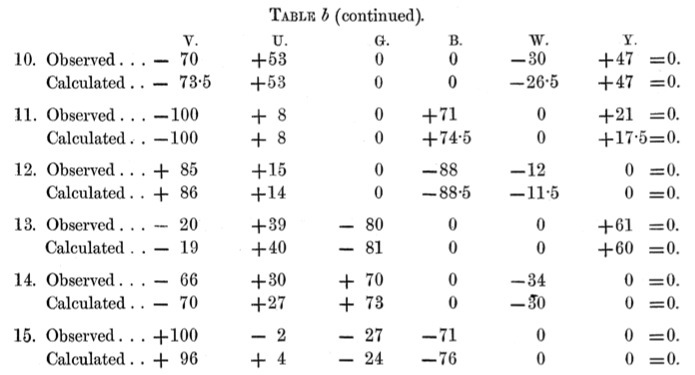 10, these results are represented in a different manner. The point D, corresponding to the sensation wanting in the colour-blind, is taken as the origin of coordinates, the “yellow” element of colour is represented by distances measured horizontally to the right from D, and the “blue” element by distances measured vertically from the horizontal line through D. The numerals indicate the different colours of the spectrum according to the scale shown in fig. 9, and the coordinates of each point indicate the composition of the corresponding colour. The triangle of colours is reduced, in the case of dichromic vision, to a straight line “B” “Y,” and the proportions of “blue” and “yellow” in each colour are indicated by the ratios in which this line is cut by the line from D passing through the position of that colour. The results given above were all obtained with the light of white paper, placed in clear sunshine. I have obtained similar results, when the sun was hidden, by using the light of uniformly illuminated clouds, but I do not consider these observations sufficiently free from disturbing circumstances to be employed in calculation. It is easy, however, by means of such observations, to verify the most remarkable phenomena of colour-blindness, as for instance, that the colours from red to green appear to differ only in brightness, and that the brightness may be made identical by changing the width of the slit; that the colour near F is a neutral tint, and that the eye in viewing it sees a dark spot in the direction of the axis of vision; that the colours beyond are all blue of different intensities, and that any “blue” may be combined with any “yellow” in such proportions as to form “white.” These results I have verified by the observations of another colour-blind gentleman, who did not obtain sunlight for his observations; and as I have now the means of carrying the requisite apparatus easily, I hope to meet with other colour-blind observers, and to obtain their observations under more favourable circumstances. On the Comparison of Colour-blind with ordinary Vision by means of Observations with Coloured Papers. In March 1859 I obtained a set of observations by Mr SIMPSON, of the relations between six coloured papers as seen by him. The experiments were made with the colour-top in the manner described in my paper in the Transactions of the Royal Society of Edinburgh, vol. xxi. pt. 2. p. 286; and the colour-equations were arranged so as to be equated to zero, as in those given in the Philosophical Magazine, July 1857. The colours were, – Vermilion (V), ultramarine (U), emerald-green (G), ivory-black (B), snow-white (W), and pale chrome-yellow (Y). These six colours afford fifteen colour-blind equations, since four colours enter into each equation. Fourteen of these were observed by Mr. SIMPSON, and from these I deduced three equations, giving the relation of the three standards (V), (U), (G) to the other colours, according to his kind of vision. From these three equations I then deduced fifteen equations, admitting of comparison with the observed equations, and necessarily consistent in themselves. The comparison of these equations furnishes a test of the truth of the theory that the colour-blind see by means of two colour-sensations, and that therefore every colour may be expressed in terms of two given colours, just as in ordinary vision it may be expressed in terms of three given colours. The one set of equations are each the result of a single observation; the other set are deduced from three equations in accordance with this theory, and the two sets agree to within an average error = 2·1. aV+bU+cG=D (16. ),where V, U, and G are the standard colours used in the experiments, and D is the colour which is visible to the ordinary eye, but invisible to the colour-blind. If we know the value of D, we may always change an ordinary colour-equation into a colour-blind equation by subtracting from it nD (n being chosen so that one of the standard colours is eliminated), and adding n of black. 1·198V+0·078U-0·276G=D (19. ).By making D the same thing as black (B), and eliminating W and Y respectively from the two ordinary colour-equations by means of D, we obtain three colour-blind equations, calculated from the ordinary equations and consistent with them, supposing that the colour (D) is black to the colour-blind. 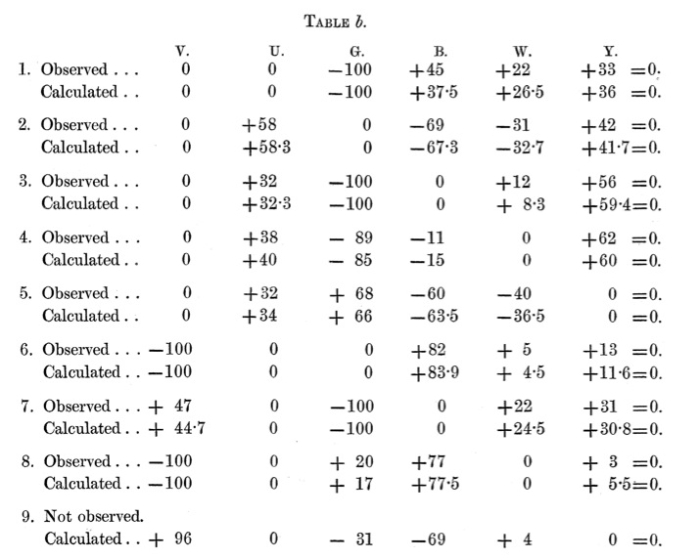 The following Table is a comparison of the colour-blind equations deduced from Mr. SIMPSON’s observations alone, with those deduced from my observations and the value of D.
The average error here is 1·9, smaller than the average error of the individual colour-blind observations, showing that the theory of colour-blindness being the want of a certain colour-sensation which is one of the three ordinary colour-sensations, agrees with observation to within the limits of error. In fig. 11, I have laid down the chromatic relations of these colours according to NEWTON’s method. V (vermilion), U (ultramarine), and G (emerald-green) are assumed as standard colours, and placed at the angles of an equilateral triangle. The position of W (white) and Y (pale chrome-yellow) with respect to these are laid down from equations (17.) and (18. ), deduced from my own observations. The positions of the defective colour, of white, and of yellow, as deduced from Mr. SIMPSON’s equations alone, are given at “d,” “w,” and “y.” The positions of these points, as deduced from a combination of these equations with my own, are given at “D,” “W,” and “Y.” The difference of these positions from those of “d,” “w,” and “y,” shows the amount of discrepancy between observation and theory. It will be observed that D is situated near V (vermilion), but that a line from D to W cuts UV at C near to V. D is therefore a red colour, not scarlet, but further from yellow. It may be called crimson, and may be imitated by a mixture of 86 vermilion and 14 ultramarine. This compound colour will be of the same hue as D; but since C lies between D and W, C must be regarded as D diluted with a certain amount of white; and therefore D must be imagined to be like C in hue, but without the intermixture of white which is unavoidable in actual pigments, and which reduces the purity of the tint. Lines drawn from D through “W” and “Y,” the colour-blind positions of white and yellow, pass through W and Y, their positions in ordinary vision. The reason why they do not coincide with W and Y, is that the white and yellow papers are much brighter than the colours corresponding to the points W and Y of the triangle V, U, G; and therefore lines from D, which represent them in intensity as well as in quality, must be longer than DW and DY in the proportion of their brightness. 1 Optics, book i. part 2. prop. 7. 2 Lectiones Opticae, part 2. § 1. p. 100 to 105; and Optics, book i. part 2. prop. 11. 3 Optics, book i. part 2. prop. 4. 4 Optics, book i. part 2. props. 4, 5, 6. 5 7th and 8th Letters to Oldenburg. 6 YOUNG’s Lectures on Natural Philosophy, KELLAND’s Edition, p. 345, or Quarto, 1807, vol. i. p. 441 see also YOUNG in Philosophical Transactions, 1801, or Works in Quarto, vol. ii. p. 617. 7 Transactions of the Royal Society of Edinburgh, vol. xii. p. 123. 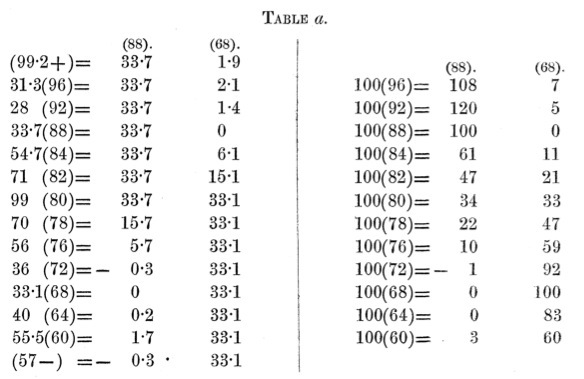 11 Transactions of the Royal Society of Edinburgh, vol. xxi. pt. 2. p. 286. 12 See the Report of the British Association for 1856, p.12.